A joint NASA and commercial provider team pulls from expertise across key human spaceflight areas to design, test, assess, and plan missions aboard the Starliner and Crew Dragon spacecraft. Before Boeing and SpaceX will be able to begin flying regular missions to the space station, they must make sure all of the systems onboard the capsule meet NASA’s safety requirements. These criteria are designed to ensure a safe journey for the crew and the capsule. Commercial Crew Program astronauts visit Launch Complex 39A at Kennedy Space Center in Florida. 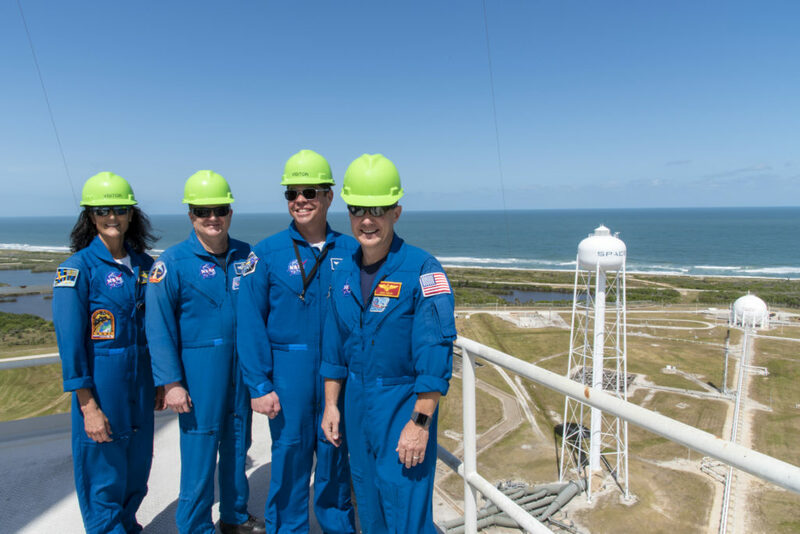 Commercial Crew Program astronauts (left to right) Suni Williams, Eric Boe, Bob Behnken and Doug Hurley visited Launch Complex 39A at NASA’s Kennedy Space Center (KSC) March 27. The astronauts toured the pad for an up-close look at preparations in work for the SpaceX Crew Dragon flight tests. The tower modifications, including the recent removal of the rotating service structure, are proof of progress in outfitting the pad for crew once again. Future integration of the crew access arm will allow for safe crew entry and exit from the spacecraft for launch and in the unlikely event of a pad abort scenario. 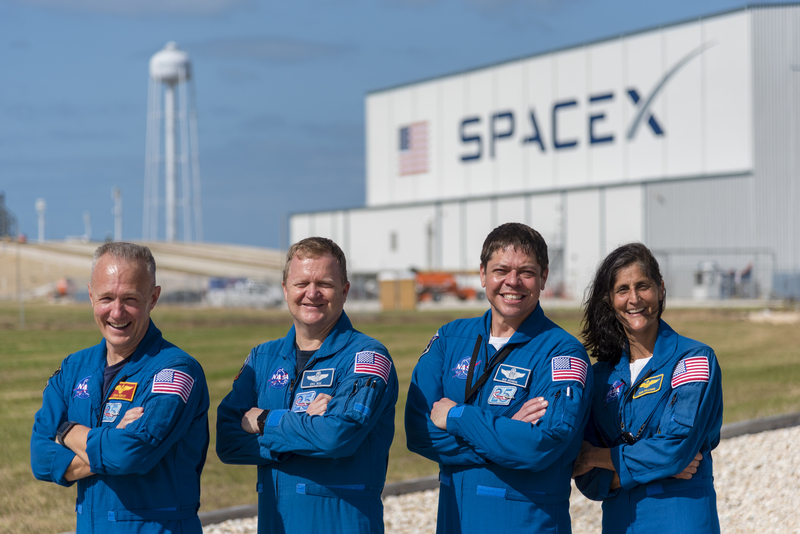 Commercial Crew Program astronauts outside SpaceX’s processing hangar. During their visit to KSC, the astronauts also stopped outside SpaceX’s processing hangar, adjacent to the launch pad and talked directly with SpaceX employees about their excitement as the program builds momentum. SpaceX and Boeing are working toward returning human space flight launches to the U.S. with flight tests targeted later this year. A C-17 Globemaster aircraft from the Alaska Air National Guard’s 249th Airlift Squadron flies overhead as pararescue specialists from the 304th Rescue Squadron, located in Portland, Oregon complete an astronaut rescue training exercise inside a covered life raft on the Atlantic Ocean. 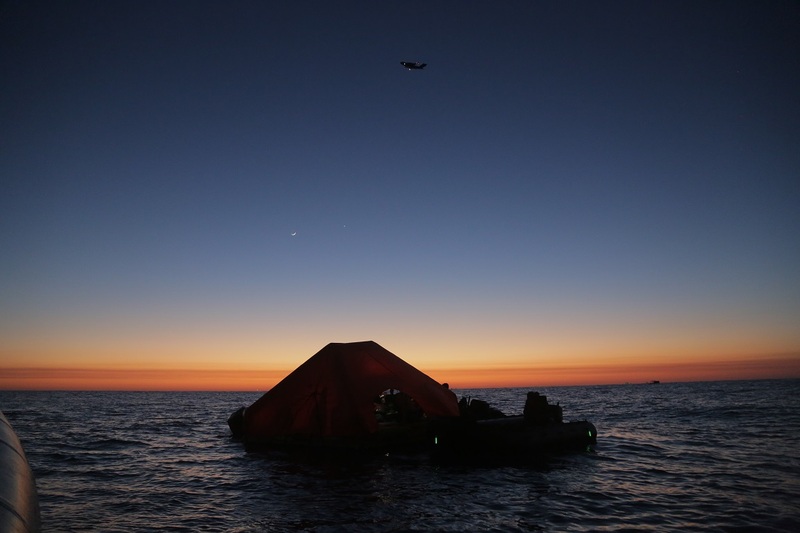 The pararescue specialists, supporting the 45th Operations Group’s Detachment 3, based out of Patrick Air Force Base, conducted the exercise in April with NASA’s Commercial Crew Program and SpaceX off of Florida’s eastern coast. The specially designed 20-person life raft is equipped with enough food, water and medical supplies to sustain both rescuers and crew for up to three days, if necessary. As NASA, Boeing and SpaceX prepare for commercial human spaceflight launches, they are training for a variety of contingencies, including emergency water landings. NASA’s Commercial Crew Program Landing and Recovery Team is leading a multi-agency operation to practice astronaut rescue missions. Rescue and recovery involves meticulous planning and close coordination between NASA, the Department of Defense (DOD), and company recovery teams for Starliner and Crew Dragon. These are the spacecraft of Boeing and SpaceX that will fly astronauts to and from the International Space Station from U.S. soil. In the event of a variety of contingency landings, an elite team of pararescue specialists is prepared to rescue the crew anywhere in the world.